(Seychelles News Agency) - Education, tourism, fisheries and exchange of specialists are areas of cooperation that Seychelles and Ghana will enhance to deepen existing relations, said the newly accredited high commissioner. 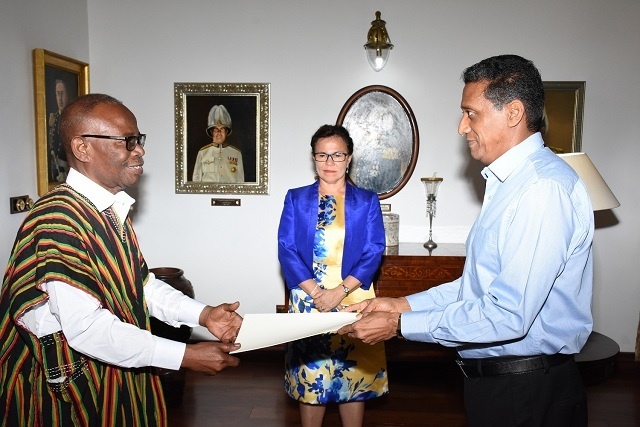 The new high commissioner of Ghana to Seychelles, George Ayisi-Boateng, spoke Tuesday after presenting his credentials to President Danny Faure at State House, Victoria. “My President sent me here to work to strengthen the relationship and take it to another level, mutually benefitting the two republics and their people,” said Ayisi-Boateng. Seychelles and Ghana have historical ties back to the days of the exile of King Prempeh I of the Ashanti people to the western Indian Ocean archipelago almost 120 years ago. Although King Prempeh later returned to Ghana, some of the Ashanti people settled in Seychelles and today Prempeh’s descendants are spread out across the archipelago. The newly accredited high commissioner will be based in Pretoria, South Africa and has pledged to travel to Seychelles often on working visits.